The US on Wednesday launched a Global Entrepreneurship programme and several other ambitious projects in an effort to bridge the gap with the Muslim world and take its engagement with the community across the globe to a new level of mutual trust and friendship. The series of announcements made by Secretary of State Hillary Clinton at the conclusion of a two-day meeting was greeted by applause from the entrepreneurs from more than 50 countries who were invited by US President Barack Obama. Clinton said the Global Entrepreneurship Program's first pilot programme had been launched in Egypt, and the US would soon launch a second programme in Indonesia, before expanding it to a dozen countries within the next two years. In her speech to more than 250 entrepreneurs at the conclusion of the Presidential Summit on Entrepreneurship, Clinton specially mentioned successful Indian entrepreneur Shaheen Mistri for her educational programmes in slums. "Entrepreneurs are tackling problems of poverty and inequity, like Shaheen Mistri, whose non-profit body provides after-school tutoring to children in slums in India," Clinton said as she referred to stories of several similar successful entrepreneurs. "They're closing gaps in healthcare delivery and access to capital, like Amjid Ali, a banker who leads health and finance outreach programmes for South Asian immigrants in England. The Global Entrepreneurship Program, Clinton said, is an initiative that will provide concrete support to new entrepreneurs, starting in Muslim-majority communities and eventually expanding to others worldwide. "Through this programme, we will work with the United States private sector partners and local businesses, along with civil society groups, to help create successful entrepreneurial environments," she said. Additionally, the administration has established partnerships with two Silicon Valley-based organisations -- the Global Technology and Innovation Partners, and the Innovators Fund. Both were started by US venture capitalists and business leaders inspired by Obama's call at Cairo to support innovation and entrepreneurship in Muslim majority communities worldwide. "Both partnerships will launch in Egypt, Jordan, Lebanon, Turkey, and Malaysia, and will then expand from there," Clinton said. "These new efforts will help increase access to seed funding, venture capital, and Silicon Valley's technology and business expertise. The State Department will help facilitate this effort by connecting these funds with local partners and institutions," she said. The US will be working to implement an exciting partnership with private US citizens headed by the former Secretary of State Madeleine Albright, to achieve its goals. "This is a team of eminent Americans from across sectors and industries who will lead an effort to engage the US private sector in carrying out our vision for a new beginning with Muslims in communities globally," she said. 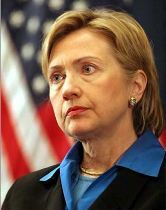 Clinton also announces the launch of a new effort to expand access to mentors for aspiring and emerging entrepreneurs." Mentors provide invaluable support and advice, but for too many entrepreneurs, good mentors are hard to find. "Through the e-Mentor Corps, an entrepreneur seeking a mentor can go online and find a person with the expertise they need on everything from securing financing to writing a business plan," she said. Several private sector groups have pledged to supply mentors from their global networks, including Intel, Ernst & Young, the Kauffman Foundation, Endeavor, TechWadi, the Young Presidents' Organisation, and Babson College. "... they reflect the Obama Administration's commitment to a new approach to development, one based on investment, not aid; on supporting local leadership and ideas rather than imposing our own. "We believe that this approach is more likely to yield lasting results in the form of greater security, dignity, prosperity, and opportunity for more people worldwide," Clinton said.